Funding for health in developing countries quadrupled from $5.6 billion in 1990 to $21.8 billion in 2007, with private citizens, private foundations, and non-governmental organizations contributing an increasingly larger percentage of global health funding, research shows. 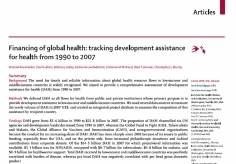 The study, Financing of global health: tracking development assistance for health from 1990 to 2007, provides the first comprehensive picture of the total amount of funding going to global health projects. The researchers found that overall, poor countries receive more funding, but there is a discrepancy between disease burden and funding amounts. Some African countries, in particular, receive less aid than South American countries with lower disease burdens. For example, Mali and Colombia have similar levels of illness, but Colombia receives three times as much health funding. Of the 30 low- and middle-income countries with the most illness and premature death, 12 are missing from the list of countries who receive the most health aid. The reasons for these funding differences, however, are unexplained. The researchers also discovered that despite the fact that the combined burden of tuberculosis and malaria is greater than that from HIV/AIDS in developing countries, HIV/AIDS receives three times the amount of funding, approximately 23 cents out of every dollar. Additionally, approximately five cents of every dollar channeled to health assistance goes to system-wide health support (i.e., funding for new clinics, doctor training, prevention programs), a priority identified by global health experts. 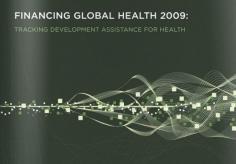 Much of the growth in global health funding has been driven largely by donations from the United States (including government and private charitable organizations), which account for more than 50% of total development assistance for health in 2007. The Bill & Melinda Gates Foundation provided the most global health aid of all private foundations, making up nearly 4% of all health assistance in 2007. Researchers looked at all public and private agency assistance to 22 low- and medium-income countries using several data sources to measure yearly volume of assistance in 2007 US$. The researchers then calculated the amount of funding by recipient country as well as the amount of funding contributed for HIV/AIDS, tuberculosis, malaria, and health-sector budget support. Prior estimates of global health funding have historically neglected to include private philanthropy and other important health flows. A few attempts have been made to measure the overall amount of development assistance for health, but these usually covered only a single year of funding. Measurements of disbursements are complex and often incomplete. There are no integrated databases for funding from private foundations and non-governmental organizations. Tracking systems often count the same money multiple times. The quality of the data are often poor. Different organizations use different accounting methods. This research is part of ongoing work by IHME to ensure that decision-makers will have the clearest possible picture of global health financing. It remains unclear why some countries receive greater funding than others, and more research is needed in this area. Additionally, tracking flows for other sectors such as education, water and sanitation, and poverty alleviation, all of which affect health, will yield additional insights about development assistance to low- and middle-income countries. Prior to this report, nearly all private philanthropic giving for health (approximately one-third of all health aid) was unaccounted for, and therefore not tracked. The researchers hope that this study will provide greater transparency in the funding for global health and that health resources can be better utilized as a result.